Cats and kittens ready to warm laps of chilly Melburnians. The Home’s North Melbourne shelter is currently brimming over with beautiful felines all in search of a loving home and a lap to warm. From 26 May – 10 June, the Home’s North Melbourne shelter is reducing the adoption fee for cats and kittens to $25. Hundreds of felines are perfecting their purrs and kneading technique in preparation for their new forever home. 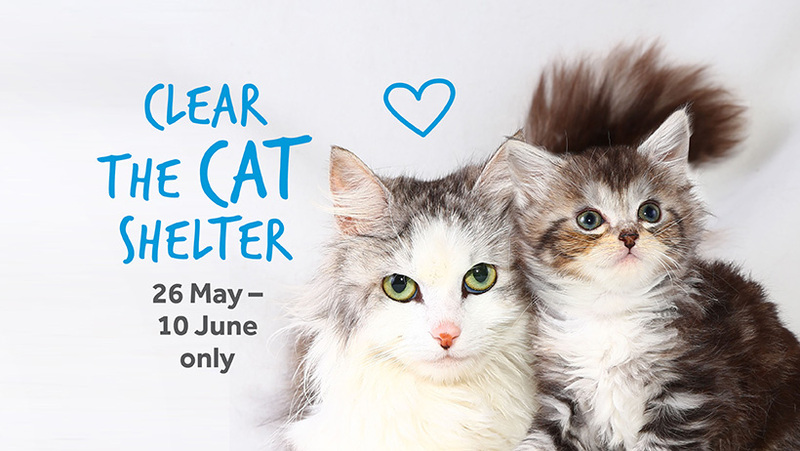 The Home’s Clear the Shelter campaign begins Saturday 26 May. Every day more cats and kittens will become available for adoption. Their profiles can be viewed here. Over the next two weeks we’re hoping to place 200 cats and kittens in their forever homes – just in time for winter. Our standard adoption process still applies to ensure all pets are matched with suitable homes. Cats and kittens will stay in our adoptions centre for as long as it takes to find them a home. We’d love for this to happen as soon as possible, so come to North Melbourne to find your purrfect lap warmer.